You are here: Home » How To Guides » Old A1WebStats System Guides » How to link your incoming enquiries back to their marketing sources. Ideally you will have an internal system that summarises all enquiries gained, so that you can gain an overview and history of what works (and what doesn’t). For example, you could gain a stronger understanding of what you gained from PPC expenditure each month. Only when you have a complete picture of what led to each enquiry, are you able to refine your website and marketing activities. If you don’t link your enquiries back to their sources then you’ll never know where best to invest time and budget. First you need to have a system that allows you to record incoming enquiries. Spreadsheet (e.g. Excel) – completed as enquiries come in. You can download an example one here that you can adapt to match your business. Shared document (e.g. via a Google Sheet) that everyone can access to record incoming enquiries. Sheets of paper (e.g. an enquiries pad) that are completed and then someone takes responsibility to input them to another system once a week, including linking the enquiries back to their sources via A1WebStats data. This method may seem basic but we find that many businesses work better like this than expecting people to complete spreadsheets etc. Time of enquiry (as close as possible). Contact method (e.g. phone, email, enquiry form). Basic details about the enquirer (name, phone etc.). What the enquiry was about (e.g. red widgets). Whether the person was on the website at the time of enquiry (for enquiry form/email enquiries, this will be pretty obvious as being a ‘Yes’ but for phone enquiries it’s possible the people had been to the website previously but weren’t on there now. As long as it’s a natural part of the conversation it’s always worth asking “are you on our website at the moment?”. Perceived source of enquiry (e.g. PPC, organic search, email shot). 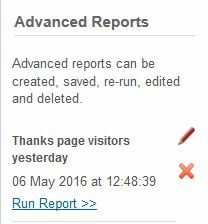 This is completed when you link the enquiry via A1WebStats data. Your enquiries log should be analysed after the end of each month, giving you a detailed view of where your enquiries came from. Enquiry form enquiries are easy to link back to sources IF your website enquiry form brings up a ‘thanks’ type url after someone completes the form. 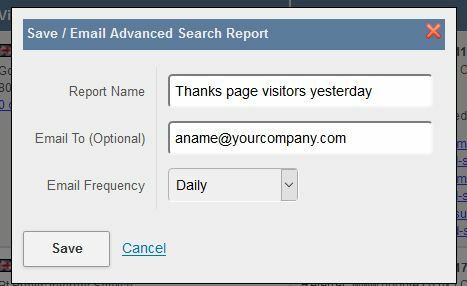 If your enquiry form brings up a thanks message but not a separate url then it’s recommended that you change this in order to gain full insights into those people who used the enquiry form. From the Dashboard select a date range (using the date picker tool on the top right), within which you last received an enquiry via your website enquiry form (typically, a week is about right). Click into the ‘Any Visited Page 1’ box and enter part of the url that comes up after someone fills in your enquiry form. In the example below we have used ‘thank’. 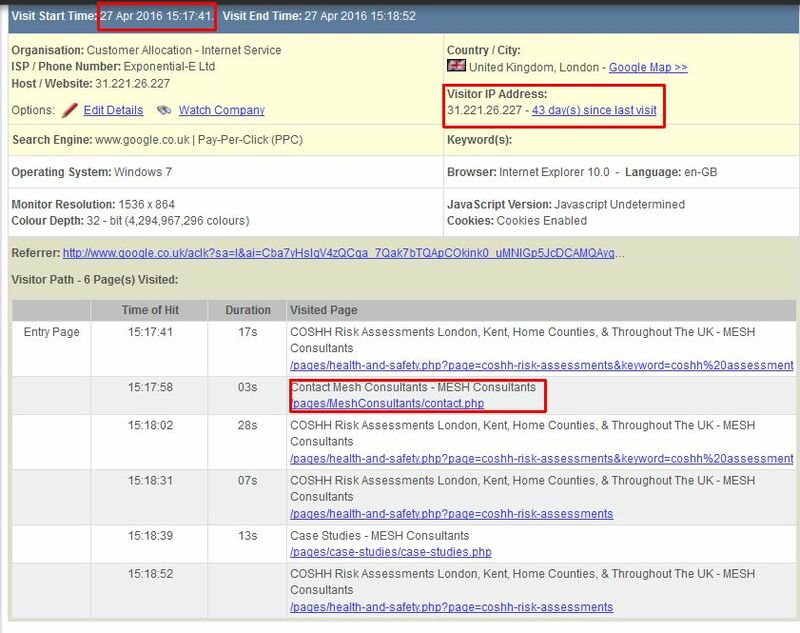 The example below shows two visitors who got to the url that contained ‘thank’ (i.e. they completed an enquiry form). Select the email frequency (daily is recommended). 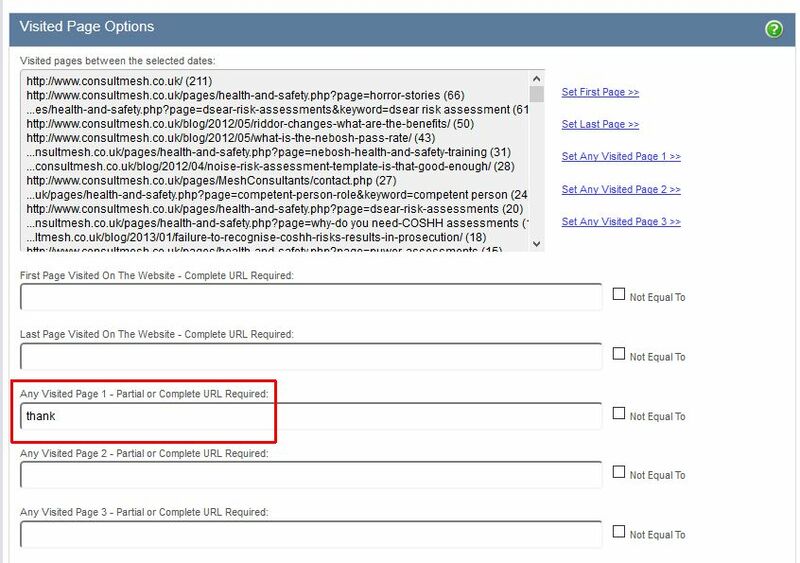 Then you can take that information (typically just what brought them to your website) and add it to your enquiries log alongside the information that would have been recorded when the enquiry form was initially submitted. When an email enquiry comes in, the person that deals with that email would ideally be the person who adds the information into your enquiries log. You then need to identify what led to that enquiry. Although not as easy as identifying the source of visitors that completed enquiry forms (because someone may have been to the website at a different time, got the email address, and made contact without going back to the website), it’s worth trying to link them back wherever possible (although it’s not always possible). Log into your A1WebStats account. From the Dashboard select the date (using the date picker tool on the top right) when you received the emailed enquiry. Click on ‘All Visitors’ from the main navigation bar and, depending on the time of day that you received the email, select either Ascending Order or Descending Order from the ‘Visitor Order’ option on the top left. Scroll through the data, focusing on the ‘Visit Start Time’ in the dark blue bar of each visitor, until you get to around the time that you received the email enquiry. If there were multiple visitors on your website around that time then it won’t be as easy to identify the visitor that contacted you by email. However, by looking at the pages each visitor looked at, you may be able to work it out. 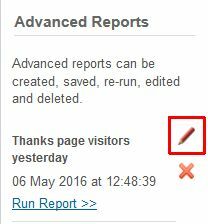 In some cases you may need to click on the ‘day(s) since last visit’ link to see if they have been to the website previously. If you are not fully sure that you can identify the emailer within your visitors data around that time of the day then you would leave that part of the enquiries log blank or as N/A (to avoid creating inaccurate data). Although it can sometimes be time-consuming to link emailed enquiries back to their source, if enquiry levels aren’t high then the task is less of a time drain. When an incoming call is received, the call recipient needs to record (in the enquiries log or on paper, to then be updated in the enquiries log) the precise time the call started. 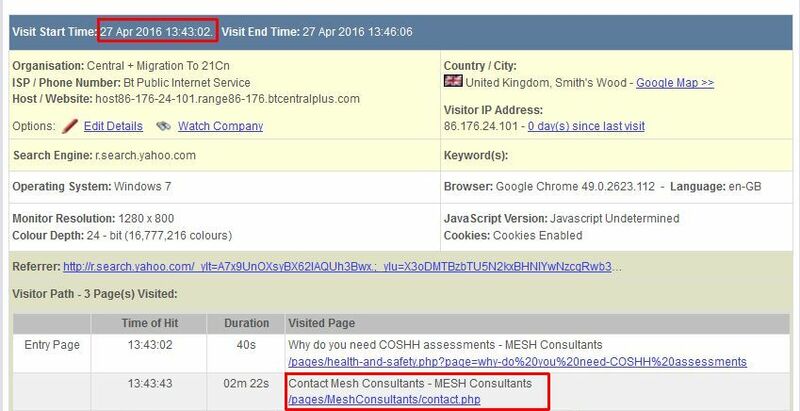 With that information it’s easier to link the enquiry back to the data within A1WebStats. If the call recipient is inaccurate with their recording of information then it leads to wasted time and inaccurate data being recorded. When the call comes in, the call recipient needs to be logged into your A1WebStats account. There is no limit to how many people can be logged into the same account at the same time. From the Dashboard select the current date (using the date picker tool on the top right). 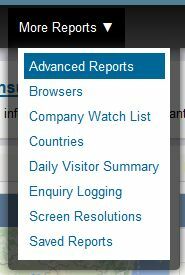 Click on ‘All Visitors’ from the main navigation bar and it will show the most recent visitors at the top of the screen. It’s likely that the enquirer on the phone is one of the first few visits. However, if they came into the website much earlier in the day, or aren’t on the website at the time of the call, then they’re not so easy to identify. Nine times out of ten they will be currently on the website. Based on what the phone enquirer is interested in, find a reason to get them to click on a certain page of your website, which will make it easier to identify them. 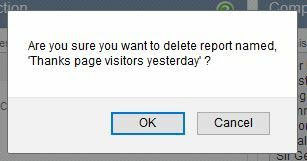 When they have done that, refresh your browser and you will be able to identify which visitor they are because it will show their visit to that page at the current time. 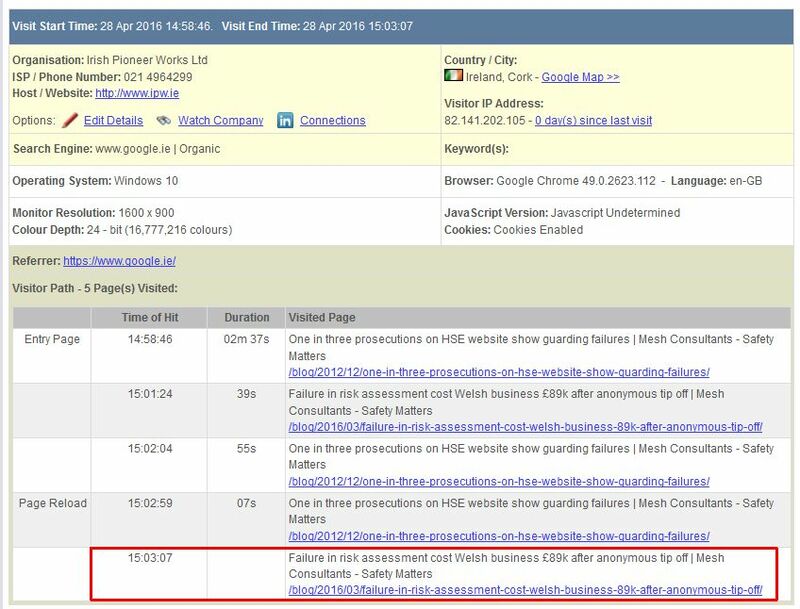 In the example below, the telephone enquirer was asked to go to the Failure in risk assessment page, as you can see from the bottom of their visit path. 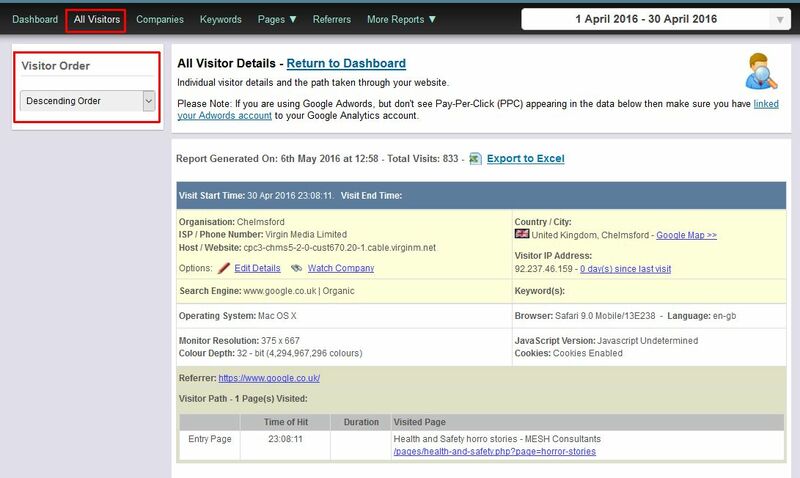 Looking at the screenshot above, we are confident that we can complete the information in the enquiries log, showing that the visitor came from organic SEO. It won’t always feel natural to encourage the person to go to a certain page of the website but typically, the conversation could be engineered towards that. For example, if someone is asking about widgets and you think they may need red widgets, then you have the opportunity to say to them “could I just get you to click on our red widgets page?”, followed by natural dialogue from there. The alternative method is used in cases where the phone call recipient is not in a position to be logged into A1WebStats. Typically they wouldn’t be logged into any electronic system and so may just make a note of the date and time of the enquiry, plus enough details for the enquiries log to be updated. From the Dashboard select the date of phone enquiry (using the date picker tool on the top right). Click on ‘All Visitors’ from the main navigation bar and, depending on the time of day that the call was received, select either Ascending Order or Descending Order from the ‘Visitor Order’ option on the top left. If there were multiple visitors on your website around that time then it won’t be as easy to identify the visitor that contacted you by phone. However, by looking at the pages each visitor looked at, you may be able to work it out. 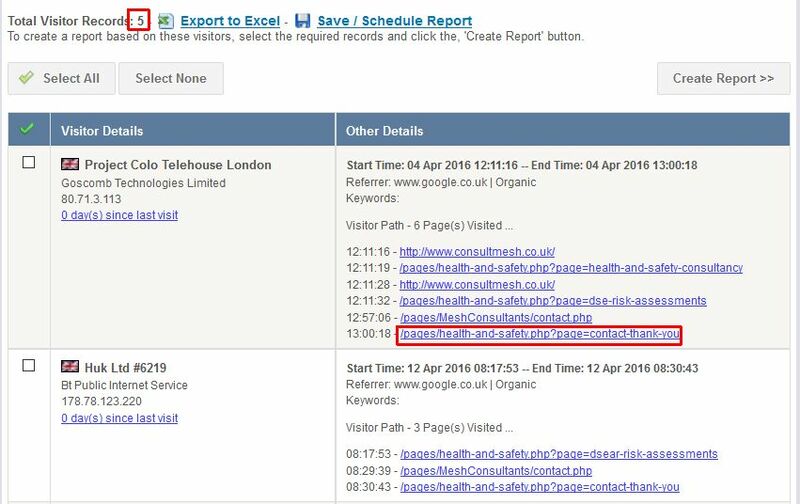 If you are not fully sure that you can identify the phone enquirer within your visitors data around that time of the day then you would leave that part of the enquiries log blank or as N/A (to avoid creating inaccurate data). Although it can sometimes be time-consuming to link phone enquiries back to their source, if phone enquiry levels aren’t high then the task is less of a time drain.